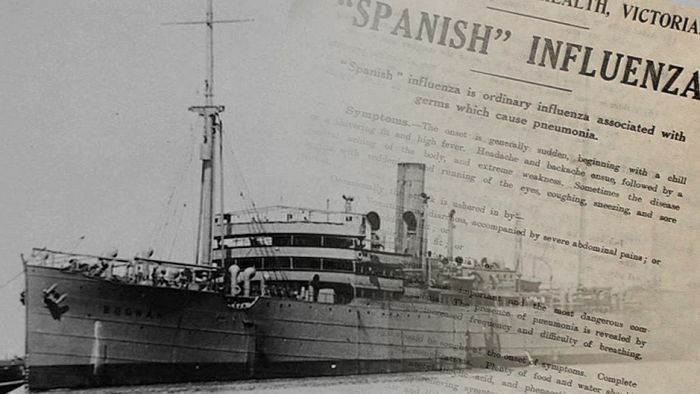 As Australian soldiers returned from World War I, a new nightmare confronted them — the most deadly infectious disease the world has ever known. The Spanish influenza emerged in its most fatal strain in 1918 and went on to cause the deaths of at least 50 million people — with some estimates much higher. In comparison, what was known as The Great War caused the deaths of about 16 million people. There are few commemorations to remember the world’s worst pandemic. But at Woodman Point, south of Perth, a quarantine station has been restored to serve as a reminder of Australian servicemen and nurses who died of Spanish flu. Several died as a result of their association with The Boonah, a vessel which set out in 1918 with more than 1,000 troops destined for the war. But instead of facing enemy fire, they were confronted by a new enemy they were virtually powerless to fight. Spanish flu did not start in Spain, but was identified there. One theory is that the virus jumped from birds to pigs, and then to humans at a medical and staging area at the French port town of Etaples in 1916. Another has it originating in Kansas, USA, or coming from Asia. What is certain is the military conflict helped spread the virus, as large numbers of people who had travelled overseas became infected and brought the flu back to their home countries. This was the fate that befell the people aboard The Boonah. Jenni Carder, president of the Friends of Woodman Point, said it must have been heartbreaking for those on board to come so close to home soil but still be kept apart from their families. “For the people on the ship, it must’ve been very troublesome to actually see the lights of Fremantle and to know that there was family here waiting for them and they couldn’t leave the ship,” she said. One of those who fell ill was Private Eric Heenan, the fourth child and second son in a family of seven from Esperance on WA’s south coast. Mr Heenan enlisted in 1918 with the support of his brother, Neville, who was serving in an artillery regiment in France. Neville Heenan gave the advice despite being gassed during the toughest years of the war. His son, retired Supreme Court judge Eric Heenan Jr, said his father was seeking adventure at the age of 18, stating his age as 21 when he enlisted in Esperance. But Eric Heenan Sr would not see any action in France, or anywhere else — by the time the Boonah got to South African waters, the war was over. Author of The Boonah Tragedy, Ian Darroch, said the disappointed soldiers came up with their own moniker. “They regarded themselves as part of the ‘too blooming late brigade’,” he said. Orders were sought from Australia as the vessel moored off Durban, where Spanish flu was rife. But the ship needed provisions. “It’s generally accepted that the labourers and others bringing provisions on board were infected with the flu, and from them it spread to various members of the ship’s company,” Mr Heenan Jr said. His father collapsed while working in the engine room of The Boonah, filling in for stokers who had fallen ill.
By the time it arrived off Fremantle, more than 300 of the men on board had the flu and the vessel was not allowed to dock. It was sent south and a much smaller vessel, Reliance, transported the ill to the quarantine hospital at Woodman Point. Mr Heenan Jr said his father was unconscious when he was carried onto shore. “You have to remember this is in the pre-antibiotic era. Penicillin was yet to be discovered and it was a very virulent disease,” he said. The small hospital was only set up to take about 30 patients and the call went out for more resources as a tent city was established on the grounds in the hot WA summer. One man had already been lost at sea after becoming delirious and jumping overboard in the night. Of those who made it to Woodman Point, 27 people from WA, New South Wales, Victoria and South Australia died. Three military nurses and a civilian nurse also succumbed to the disease. Mr Darroch said the toll could have been much higher. “It was a distinct possibility that many more would die because the quarantine station was quite small and for it suddenly to have nearly 400 very ill men dumped on them was a huge burden,” he said. Ms Carder said the fact that so many were saved from death was testament to the skills and commitment of the medical staff. One man had a particularly lucky escape. “Eric John Bray was one of the youngest soldiers of The Boonah, and they declared that he had died,” she said. “They took him to the mortuary. There was a sergeant on guard there and he happened to look down and he saw Eric John Bray moved his shoulder, and they realised he was alive so they quickly brought him back to the isolation hospital where he made a full recovery. While Eric Heenan Jr’s father recovered from the flu and was discharged after six months of service in 1919, other members of the Heenan family were not so lucky. One of his aunts died, along with one of his wife’s aunts in Scotland. “One has to admire the devotion of those who took on the care of those troops,” Mr Heenan Jr said. Eric Heenan Sr followed his brother Neville into the legal profession, and worked in Kalgoorlie. He became Labor MP in the Legislative Council for North East Province in 1936, and served for 32 years. He died in 1998 at the age of 98. “One thing I think emerges from this is that how fortunate one is to have a father, or a grandfather, or any relative that survived the war and allows a family to continue,” Mr Heenan Sr said. “When you think of those who didn’t return — what a loss, what a loss to our nation.